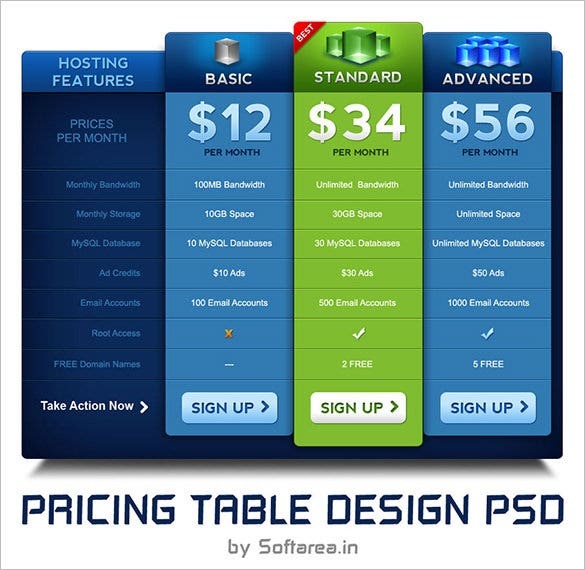 The pricing table is the most important for almost every business website whether you own a café or a hosting company. 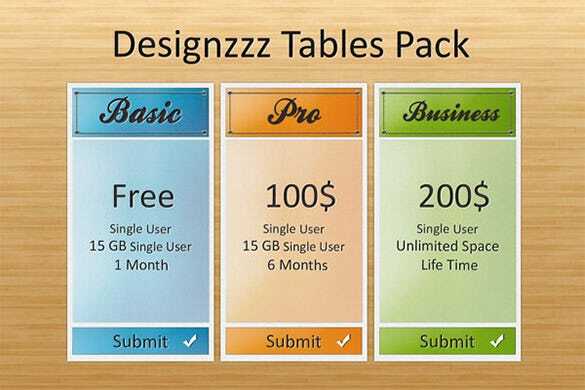 But these tables are quite an elaborate task with all their rows and columns and hence it’s smarter to go for PSD Pricing Table Templates here. The template gives you idea about internet connection with bandwidth scheme and rental plans. 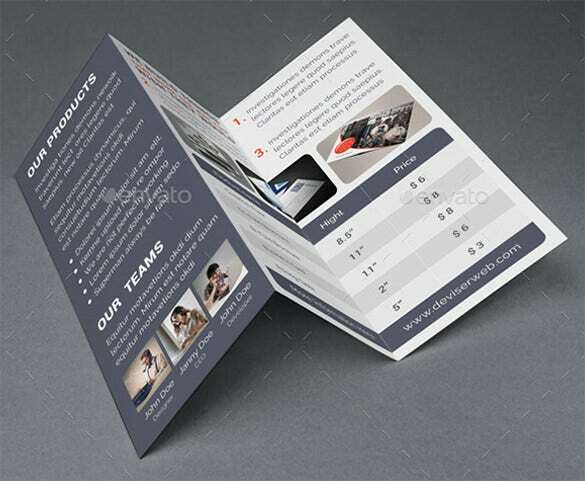 The templates can be tri-fold in structure with little colour on the white base. Two titles on top and bottom can be added with different colours. 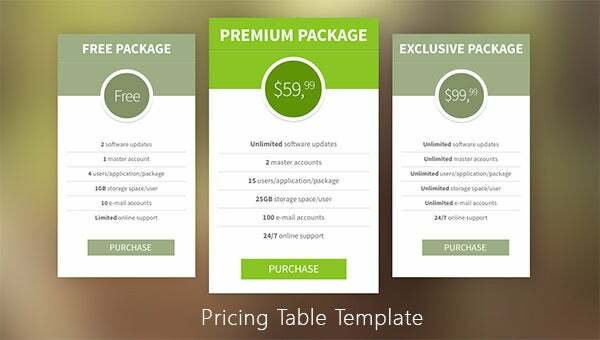 With such a template you can add any sort of product with minimum description. You can even customize it and put in various plans of business, pro and optimum as per your use and convenience. 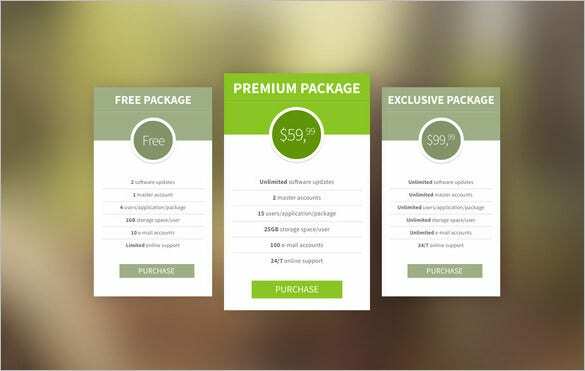 This template gives you an idea of various package details. 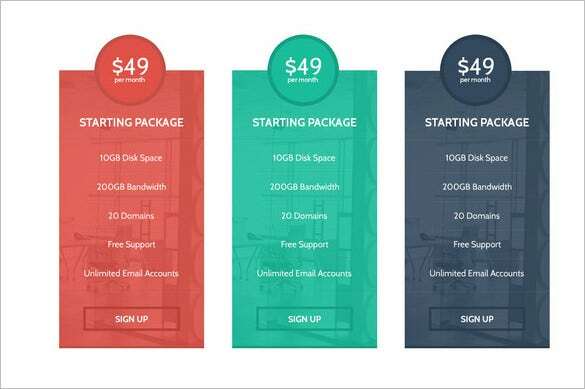 Disk space, bandwidth, free support, range of domains and as many email accounts as possible are provided on three ranges from basic, premium to standard plan. 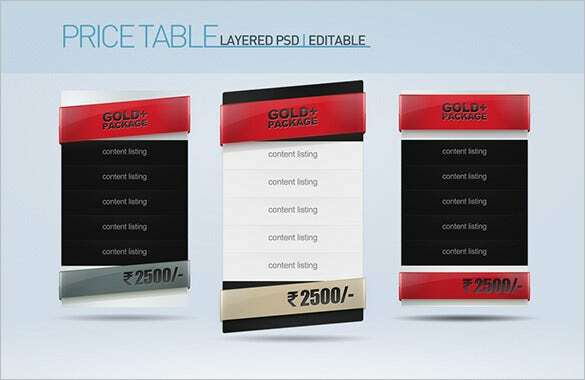 Various kinds of package resulting in gold are added in the template. Black colour to white colour is the centre of focus of the template version. You can add in listing of content as well on the templates. 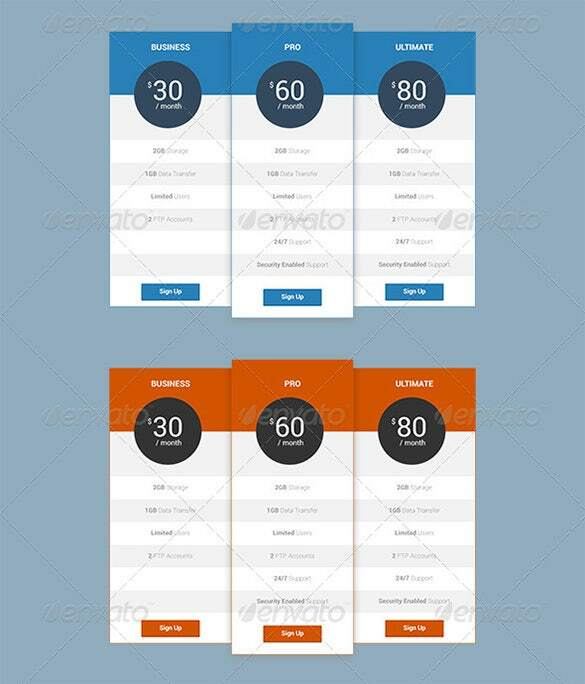 The template has a pack which contains basic to pro and business packs in different colours in a narrow and vertical design. 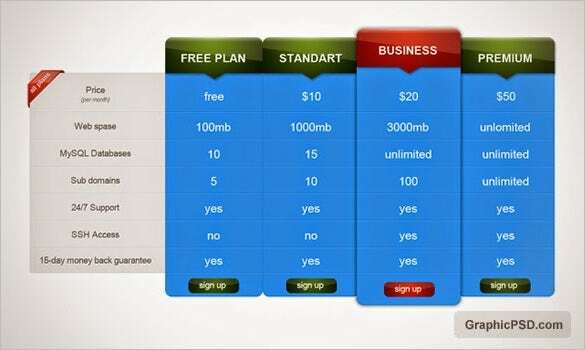 You can be the single user and enjoy unlimited benefit. Some has a lifetime package whereas others have one month to six months benefit. 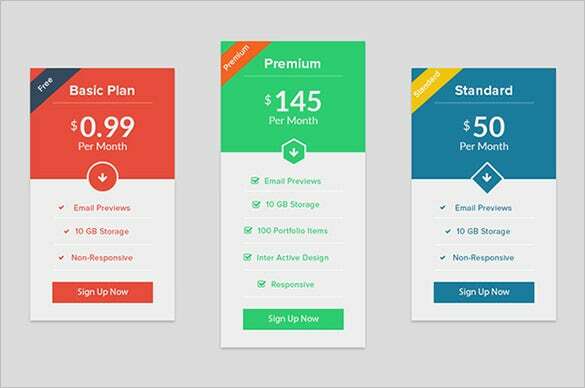 Card format of the template of data plans are provided. You can take it as an inspiration and work towards it. Price of individual pricing is listed in one corner. The template acts as a tri-fold brochure sort of. 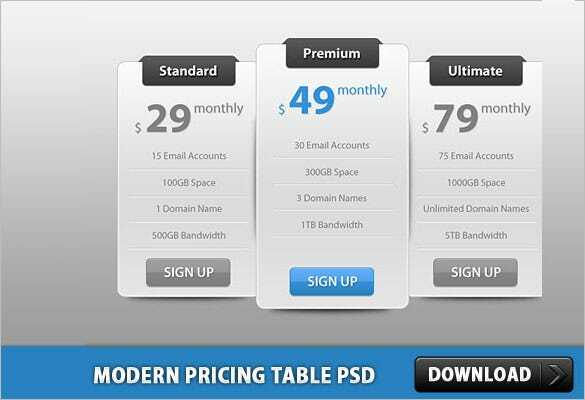 These free PSD Pricing Table Templates offer you a readymade structure for the price table which you simply need to modify as per your specific plans and rates. 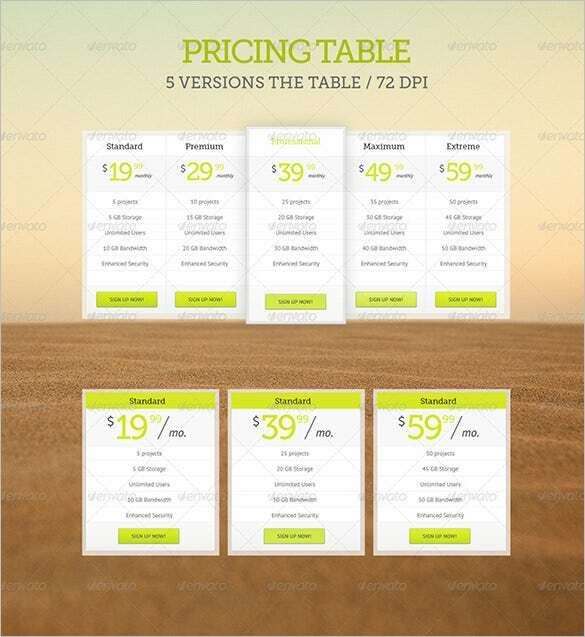 You will be able to save a good lot of time and energy with these pricing table PSD templates. The online world offers these templates in huge variety so that you can always have a compatible pick.